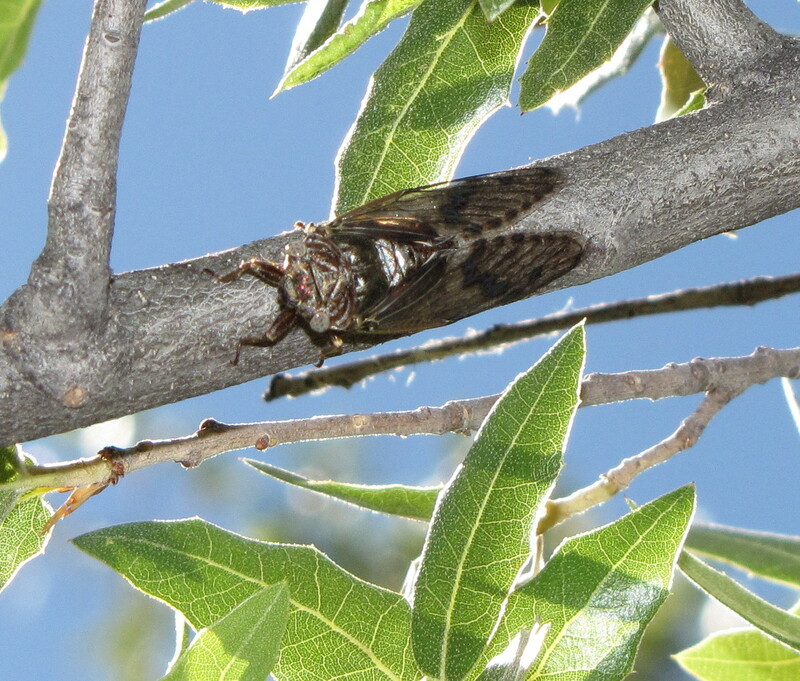 Here in southern Arizona it is cicada season. 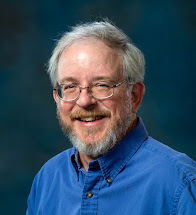 It is fitting that these insects should appear at the hottest time of the year, for their shrill “songs” seem to be the very sound of heat, reminiscent of something sizzling in the frying pan that is the Sonoran Desert in late June. Cicadas are “true bugs” in the order Hemiptera, suborder Auchenorrhyncha, and family Cicadidae. They have piercing-sucking mouthparts used to tap sap flowing in the limbs of trees and shrubs. 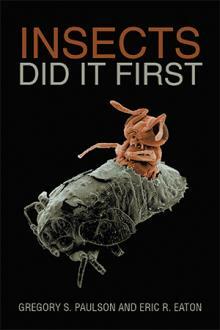 Actually, they live underground as nymphs for the bulk of their lives, sucking on sap in the roots of trees and shrubs. 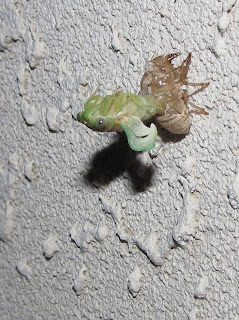 As if the racket of male cicadas is not enough to announce their presence, the ghostly exuviae of nymphs adorn nearly every vertical surface in the wake of their emergence from their underground youth. Examining one of these shed exoskeletons reveals several interesting details. The front legs of the nymphs are stout, toothed, and built for digging through the soil and getting from root to root. When their development is complete, those muscular appendages double as grappling hooks, pulling the insect up a tree trunk, fence post, or other handy object. 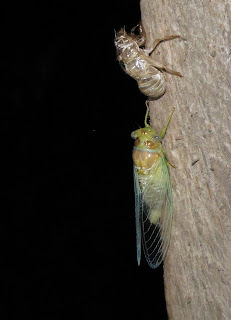 The grand entrance of the adult is the culmination of a life cycle that spans between three and seven years, on average, for most species of cicadas. The celebrated periodical cicadas in the genus Magicicada that appear only every 13 or 17 years, depending on the population or “brood” assigned Roman numerals, are synchronous in their massive emergences. Most cicadas qualify as “annual” species where individuals appear every year (or nearly so), because the generations are staggered. 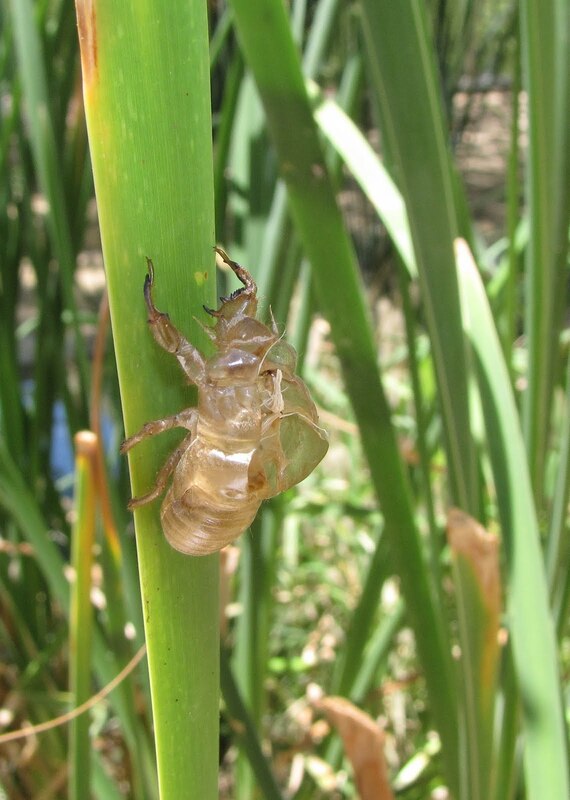 Only the male cicadas “sing,” most species possessing an elaborate internal percussion organ called a tymbal. The tymbal is vibrated at a high frequency by muscles in the abdomen of the insect. The sound resonates in a largely hollow abdomen and comes pouring out of paired chambers, each covered by a large plate called an operculum. The insect can bend its abdomen in such a way that the sound can be amplified at will. Any person within earshot wishes they had brought their earplugs. Apparently, the serenade works on female cicadas, for they are indeed attracted to the males. There are apparently at least ten species of cicadas within ten miles of Tucson, and they seem to be separated by elevation. Here on the simmering valley floor, Diceroprocta semicincta is the dominant species, clinging to the branches of mesquite trees for the most part (see image above). A mere couple of hundred feet higher, in the foothills of the Santa Catalina Mountains, the “cactus dodger,” Cacama valvata almost completely replaces D. semicincta. Besides differences in the “songs,” cactus dodgers live up to their name by appearing quite wary. Approach one and he begins walking backwards down the branch from where he is singing. Hanging upside down from a slender creosote branch seems to benefit C. valvata in a number of ways. It allows maximum projection of its “music,” and the white, wax-coated belly of the beast reflects the intense desert heat, preventing the bug from cooking in the mid-day sun. Higher still, in the oak-juniper zone, we find another Diceroprocta. D. swalei is easily recognized by the dark zig-zag band across each front wing. Around 6,000 feet in elevation we come across the “wing-bangers” of the genus Platypedia. Putnam’s cicada, Platypedia putnami, occurs in among the evergreen trees, in the understory. Male wing-bangers lack the tymbals of their cousins, so they produce sound by tapping their wings on the branches where they sit. The tick-ticking noise is subtle to humans, but apparently effective enough to attract mates. Cicadas are not without their enemies. Many a bird preys upon them, repeatedly smashing the insect against a hard surface to “tenderize” it before gulping it down. Sometimes the cicada escapes during this treatment. 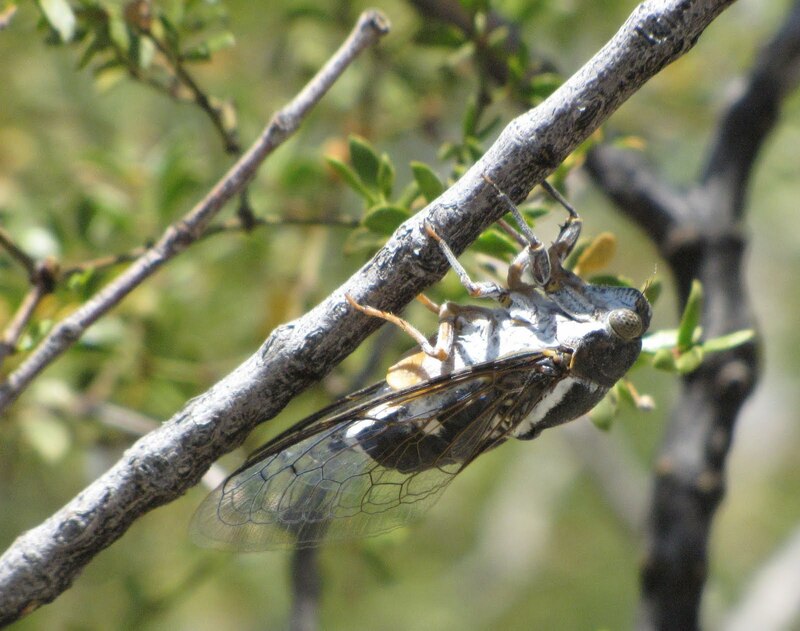 Cicadas are a lot less likely to escape the paralyzing sting of a huge “cicada killer” wasp. 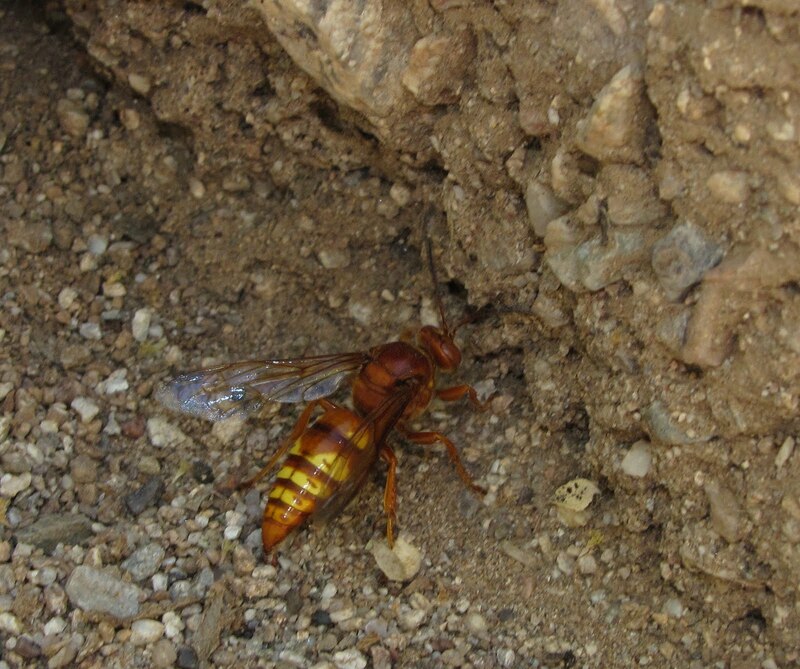 Here, the western cicada killer, Sphecius grandis, is harvesting cactus dodgers. 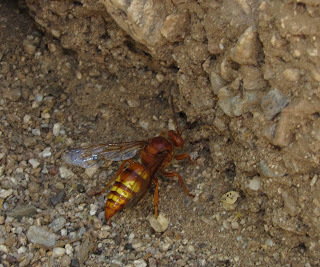 Each female wasp excavates a burrow that branches into several underground cells. 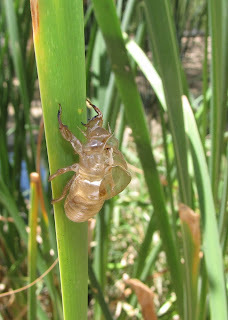 Each cell is stocked with one or two paralyzed cicadas and a single egg is then laid in the cell. The egg hatches into a larva that will eat the cache of cicadas. One cicada yields a male cicada killer. Two cicadas yields a female wasp. 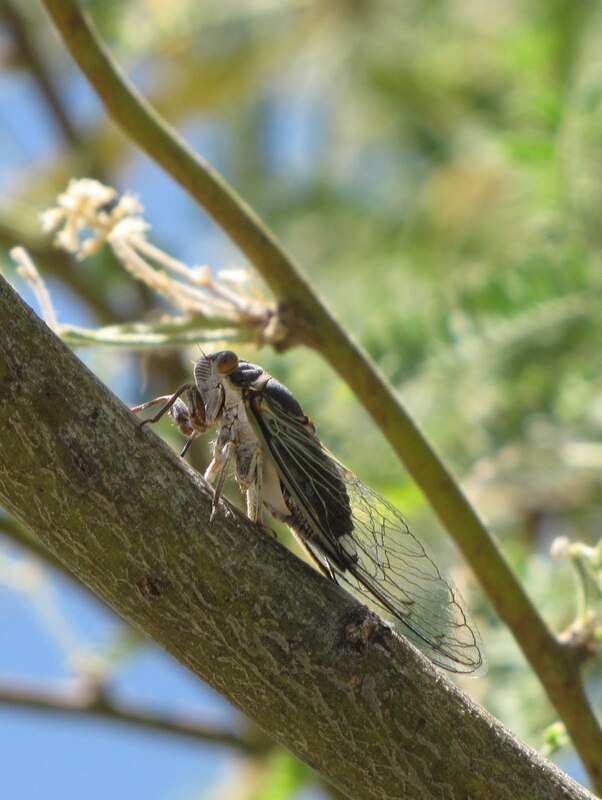 It may not be possible for you to “enjoy” cicadas, at least not in the auditory sense, but one has to marvel at these amazing insects and their place in the ecosystem. Find out what species are in your own area. 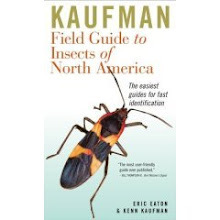 You might start by surfing such great websites as Cicada Mania, or Cicada Central. Wow, Eric, that really IS everything I've ever wanted (or not) to know about cicadas - and actually I do enjoy hearing them. They signify summer in the desert to me as much as blossoms on the saguaros. Thanks for a very interesting and informative piece. Those are incredible pictures, too! The cicada killer is very interesting, especially the part of two cicadas for a female and one for developing a male. Thanks for sharing. When do they STOP? I hate them!